Routing leads through a third party has fostered a lot of misconceptions around it. The biggest is that doing so increases the time it takes for the lead to hit your Lead Management System or CRM, slowing down your initial contact with them. According to The Zillow Group Report on Consumer Housing Trends in 2017, 81%of home buyers expect a response to their initial communication with a real estate professional within a day or less. The quicker you respond, the more likely you are to close the lead. So then, why route leads through a third party like Mortech? For starters, it isn’t actually slower at all. Mortech routes any lead that comes in directly to your Lead Management System or CRM of choice in under a second, meaning that you won’t be delayed at all in responding to it. There’s no risk of being too slow when contacting a lead. 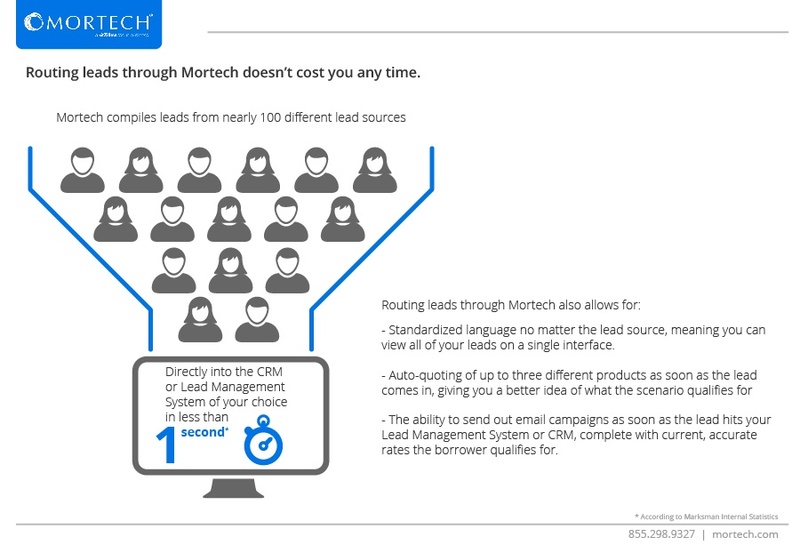 Mortech has nearly 100 different lead sources it pulls leads from, standardizing the language of all of the incoming leads, and compiling them into your system of choice. This saves you the time of having to code each individual lead source and modify the post messaging every time one of your lead sources updates. As leads come in from the different lead sources you’re pulling from, Mortech’s standardizes them, compiles them, and makes them all viewable within a single interface. One of the biggest benefits, though, is auto-quoting. Say a prospective borrower enters in their scenario information online - the lead gets sent to you, and comes with three different products the scenario qualifies for, all at once. This allows you to not only better understand the scenario, but also gives you the flexibility to make the best possible choice for your borrower and for you. You can also begin email or phone campaigns with your lead as soon as it comes into Lead Management System or CRM, while giving them instant and accurate rates that have already been auto-quoted for you. If they’re not happy with the current rates, you can even enroll them in rate trackers that will send alerts as rates go up or down, and hit the range they want. So, why route leads through Mortech? Given the fact that it doesn’t cost you any time, and provides such significant benefits to you, the better question is: why aren’t you routing leads through Mortech? To find out more about lead routing and how Mortech can consolidate all of your leads into a single source, or any of the other tools we can offer you to improve your mortgage business, click the button below to contact us right now.